Club President Joan Bingley opened the meeting and introduced the first speaker. 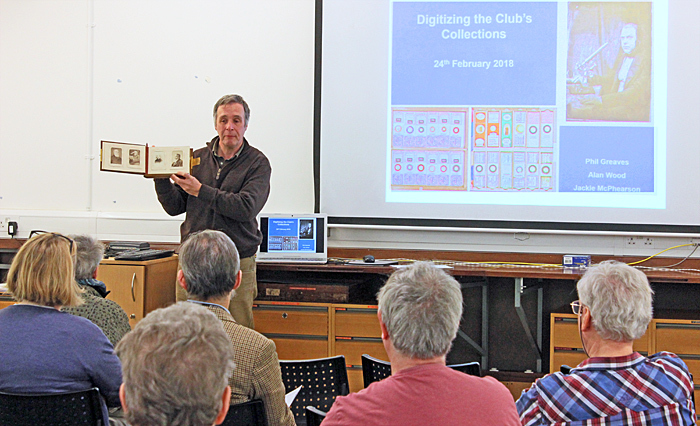 Phil Greaves is the Club’s archivist, and he explained what we have in the collections (20,000 microscope slides, 2000 photographs, videos, member’s notebooks, historical documents and antique microscopes and accessories. Phil also outlined our progress to date with photographing the slides and transcribing their label data and the tasks that lie ahead. Jacky McPherson has taken a keen interest in the slides made by E. D. Evens and has transcribed the data from over 2000 of them. She was not able to attend the workshop, but provided a well-received video describing the slide collection, what has been done and what still needs to be done. 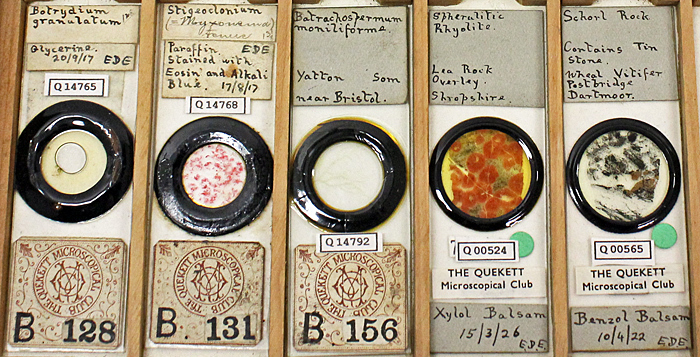 Jacky also provided a PowerPoint presentation showing lots of microscope slides that have not yet been transcribed. The second speaker was Alan Wood, the Club’s webmaster, who showed test versions of a slide database, an index of photographs of members, and a gallery of other photographs. These are not expected to be the final products; we are hoping for ideas from our members on how to improve them. Steve Gill has designed a database for the slides that allows free text searches and searching in fields, and displays photographs of the slides and their data. At present, the photographs are of trays of slides, but we intend to have photographs of individual slides. You can also browse the photographs. The test data is mostly confined to the Caffyn and Evens collections. We have around 1500 other photographs that do not lend themselves to an index, including ones from excursions, indoor events, groups, places, equipment and photomicrographs. These could perhaps be displayed in image galleries within the main website. The demonstration includes only 10 photographs at 300 pixels on the longer side; click any photo to see a larger version. Paul Smith had spent a lot of time with an inexpensive database called Recollector and the images and label data for the Evens slides. Unfortunately, the only HTML output that the program can generate does not include any way to search. After the demonstrations, there were lots of questions from members. The photographs of slides in trays are stored on archival CDs, but drives that can read CDs are not as common as they used to be. Images are currently stored as JPG files, but lossless TIFF files might be better. How big should our stored images be in order to allow for future increases in screen sizes and resolution? Should we store files on local hard disks, or local solid state disks or in the cloud? How big should the images in our databases, indexes and galleries be now? We must not damage items when labelling them, so Q number labels on slides should be made with acid-free paper and attached with methyl cellulose. Notes on the back of photographs should be made with soft pencils. We want to have photomicrographs of slides at some stage, so when slides are seen to be deteriorating they should be first priority for photomicrographs. Should we photograph the specimens on a batch of slides in bright field, and then go back later to photograph them in dark ground, and then again with phase contrast, and then again using crossed polarisers? Or should we photograph one slide at a time using all appropriate lighting and contrast methods? While having photographs of individual slides would make the database more attractive to use, we only have about 3000 that have not been photographed in trays, so the full database could be available sooner if we photographed the remaining 3000 in trays. The process of transcribing slide label data into Excel spreadsheets was explained, and a few more members volunteered to help. The Excel format seems to be well supported, but has already changed from XLS to XLSX and could change again in the future. It might be a good idea to store data in CSV format as well. Was it a good idea to be dependent on one man to develop our databases and indexes? How difficult would it be for someone else to understand and take over the files? Should we be looking at the systems such as EPrints 3 (used by the Linnean Society), Axiell (used by the Natural History Museum) or Modes? Noted that commercial organisations can fail (as we found with the Cubik version of the website), that using well-supported file formats (JPG and XLSX) would enable migration to another system if this became necessary, and that investigating other systems now would cause undesirable delays. Agreed to proceed with Steve Gill’s system, adding new batches of data and images as they become available so that members can see that progress is being made. What conventions should we use for file names? For compatibility with WordPress and with Unix web servers, Alan recommended all lower case, no spaces, with hyphens (not underscores) as word separators. The volume of data that we are generating is starting to cause problems. We have been exchanging files with the free version of Dropbox, but the limit of 2GB can be a problem. Uploading data to the website using sftp has taken almost 12 hours for some of the recent material, and we only have a fraction of the final data, so the webmaster may need a fast fibre connection. After the questions, we were able to examine some of the items from the Club’s collections. 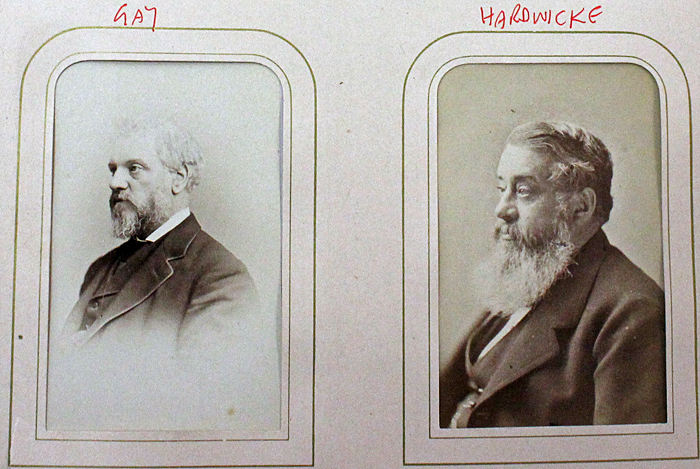 The Club has 2 albums of photographs of members that were donated in 1875. 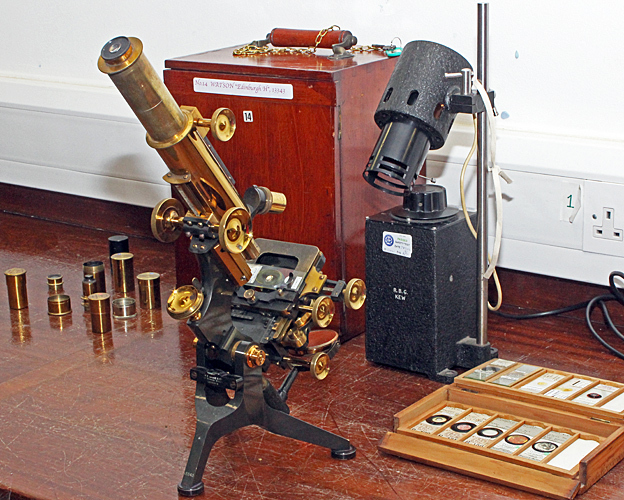 The Club has a few antique microscope, including this Watson Edinburgh H that was used to show some of the slides from the collection. The Club’s latest acquisition is this Chinese inspection camera that was used to display some of the slides from the Doug Richardson collection on a monitor. 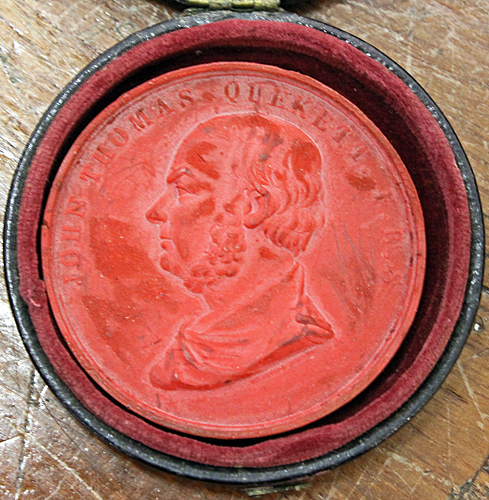 This medal of John Thomas Quekett, apparently made of wax, is one of the more unusual items in the collection.